Anesthesiologists typically earn salaries in the range from $108,462 to $392,390 a year including bonuses and profit sharing according to salary data provided by Payscale. The yearly bonuses amount to up to $50,951, and reported earnings from profit sharing go up to $49,149 a year. Anesthesiologists’ annual salaries can vary depending on a number of different factors. Years of professional experience is among the major ones. Anesthesiologists with 1 to 4 years of experience typically earn between $98,264 and $356,351 a year. Those with 5 to 9 years of experience make between $146,254 and $362,409 a year, professionals with 10 to 19 years of experience are paid between $121,529 and $395,600 annually, and anesthesiologists with 20 or more years of work experience report salaries in the range from $147,949 and $399,110 a year. The annual bonuses typically increase with experience. Anesthesiologists with 1 to 4 years of experience get $3,931 a year on average, those with 5 to 9 years of experience earn $6,104 a year, professionals with 10 to 19 years of experience earn $5,000 a year, and those with 20 or more years of experience report being paid $18,000 a year on average in bonuses. Earnings from profit sharing tend to go up with years of experience, too. Anesthesiologists with 1 to 4 years of experience typically get $4,880 a year, those with 5 to 9 years of experience earn $16,000 a year on average, professionals with 10 to 19 years of experience get $24,955 a year, and those with 20 or more years of experience get $28,904 a year on average according to Payscale’s salary statistics. On average, anesthesiologists earn $284,190 a year according to Payscale. The annual salary can vary greatly depending on location, employer, subspecialty, and years of work experience. The Bureau of Labor Statistics (BLS) reports that anesthesiologists employed in physicians’ offices earn an annual mean wage in the amount of $241,910 a year and those working in general medical and surgical hospitals earn $196,700 a year. Professionals working in outpatient care centers earn $225,360 a year, those employed by colleges, universities and professional schools are paid $131,890 a year, and anesthesiologists working in offices of other health practitioners earn an annual pay in the average amount of $204,500. The starting salary for anesthesiologists with less than a year of work experience is generally in the range between $58,958 and $333,329 a year according to salary information provided by Payscale. These professionals get $9,500 a year on average in bonus money. The average hourly rate for anesthesiologists can vary depending on a number of factors, from experience and area of specialty to city and employer size. Anesthesiologists with 1 to 4 years of experience typically earn between $10.75 and $162.50 per hour, those with 5 to 9 years of experience make between $26.21 and $148.45 per hour, and professionals with 10 to 19 years of experience earn from $112.50 to $225.00 per hour. Anesthesiologists employed in general hospitals typically make between $23.40 and $136.55 per hour, and the average hourly wage for professionals working in hospitals ranges from $22.51 to $122.55. Anesthesiologists working for private practices, on the other hand, earn significantly more, between $77.00 and $170.00 per hour according to Payscale. The average hourly rate for the profession also varies depending on location. The Bureau of Labor Statistics (BLS) reports that anesthesiologists based in California earn $104.26 per hour, those working in New York make $103.53 per hour, professionals employed in Texas make $111.05 per hour, those based in Illinois earn $105.98 per hour, and anesthesiologists working in Pennsylvania are paid a median hourly wage of $119.79. The figures also vary depending on employment setting. Anesthesiologists working at physicians’ offices earn $116.30 per hour, those employed in outpatient care centers make $108.35 per hour, professionals working in general medical and surgical hospitals earn $94.57 per hour, those employed in specialty hospitals (excluding psychiatric and substance abuse centers) are paid $110.29 per hour, and anesthesiologists working in offices of other health practitioners make $98.32 per hour on average. Anesthesiologists’ salaries can be very different from state to state. Professionals working in New York typically earn between $58,983 and $358,750 a year, those employed in California make between $100,330 and $394,559 a year, and anesthesiologists based in Texas earn from $102,040 to $389,776 annually. Professionals working in Florida earn between $122,339 and $393,555 a year, those based in Illinois make between $99,666 and $339,793 a year, and anesthesiologists employed in Ohio earn from $101,367 and $389,776 a year. Anesthesiologists working in Pennsylvania report salaries in the range between $78,906 and $343,301 a year according to Payscale. The Bureau of Labor Statistics (BLS) reports the highest annual mean wage for the profession to be in Pennsylvania ($249,160), followed by Texas ($230,980), Illinois ($220,450), California ($216,850), and New York ($215,350). Anesthesiologists’ salaries can vary significantly from city to city. New York-based professionals typically earn between $60,820 and $385,268 a year, those working in Chicago make between $77,500 and $337,521 a year, and anesthesiologists based in Houston are paid between $101,806 and $398,665 annually. Professionals employed in Los Angeles earn from $174,420 to $402,683 a year, those working in Dallas earn between $148,738 and $260,695 a year, and anesthesiologists working in Boston make between $90,545 and $298,326 a year. Professionals based in Philadelphia report salaries in the range between $79,189 and $341,685 a year according to Payscale. Area of specialty is another major factor that can affect an anesthesiologist’s salary. For example, professionals specializing in anesthesia report earning between $120,200 and $374,351 a year, those whose expertise lies in pain management generally make between $98,633 and $378,825 a year, and anesthesiologists specializing in critical care report salaries in the range from $245,659 to $356,078 a year according to Payscale. Anesthesiologists’ salaries can also vary depending on hospital setting. For instance, anesthesiologists working for general hospitals generally earn between $102,308 and $377,562 a year, those working in ambulatory care or surgery centers make between $100,671 and $361,941 a year, and professionals working in physicians’ offices or private practices earn from $196,527 to $350,000 a year. Anesthesiologists working in acure care hospitals make between $270,000 and $384,177 a year, while those employed at colleges and universities report an annual income in the range between $202,500 and $270,000. 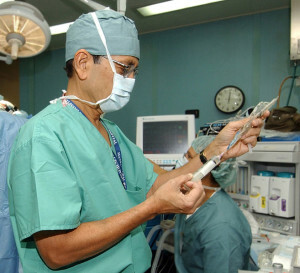 Salaries can also sometimes vary depending on an anesthesiologist’s academic background. For example, anesthesiologists who graduated from the Harvard Medical School typically earn between $98,264 and $361,014 a year, those who got their medical degree from the University of Pennsylvania make between $245,659 and $330,644 a year, and professionals who graduated from the Johns Hopkins University report earnings in the range from $160,000 to $340,129 a year according to Payscale.